Posh chairman Darragh MacAnthony (left). Ah if only promotions and trophies were handed out for enthusiasm and passion, Peterborough United would already have been driven into the Premier League by chairman Darragh MacAnthony. MacAnthony popped up on ‘Periscope’ last night (January 26), a social media prop which facilitates a question and answer session with fans/critics (they are often one and the same at the ABAX). It suits the smooth-talkers and the quick thinkers, and those confident in their opinions and knowledge. Posh striker Tom Nichols has a big fan in chairman Darragh MacAnthony. No-one would accuse MacAnthony of low self-esteem (it might be one reason why he’s made millions from business) and he was quick to announce that ‘my way is usually the right way’. He breezes through these sessions, even when his team’s current form suggests it could be a troublesome hour. If anyone wanted to lay a glove on him, they failed. MacAnthony is the Floyd Mayweather of Twitter. Brutal honesty helps. 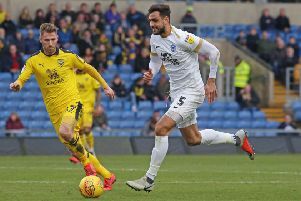 MacAnthony used a four-letter word to describe Posh’s January form. He’d probably use a similar word to describe his broken relationships with former manager Graham Westley and the club’s highest-profile fan, talkSport presented Adrian Durham, both of whom were name-checked last night. MacAnthony talks so quickly he’d test the skills of a court stenographer. It lead to a breathless hour when everything from transfer targets to ambitious fans’ schemes were discussed. As was the recent departure of MacAnthony’s driver, the possibility of equipping mascot Peter Burrow with a drum (oh please no) and catering issues which will lead to the chairman testing every item available from the ABAX kiosks, surely a prize example of devotion above and beyond the call of duty. On a serious side MacAnthony said recent performances had led he and manager Grant McCann to re-assess their vow not to make January signings, and that contrary to popular opinion he is not averse to signing players in their late 20s or early 30s. He revealed Adil Nabi (remember him?) was training at a League One club, and that he would be sitting down with young midfielder Jermaine Anderson to discuss a new contract soon, and that Luke McGee would not be playing for Posh next season unless promotion to the Championship has been achieved. Posh defender Ryan Tafazolli could play in the Premier League one day. Most worryingly from a Posh fan’s point of view, the chairman was unsure skipper and current star man Chris Forrester would be staying at Posh. “Every player in the land has a price,” MacAnthony stated, including teenage midfielder Leo Da Silva Lopes, although the interested clubs (including Manchester United apparently) had yet to meet the Posh valuation. MacAnthony also bigged up Ryan Tafazolli (good enough for the Premier League if he keeps progressing) and striker Tom Nichols (a player treated unfairly by Westley and Posh fans), while claiming Marcus Maddison is the best young attacking player in League One, when he has his game head on. The chairman’s confidence in Nichols led to an expensive wager with a Posh fan about scoring 20 goals in a League One season (Nichols, not the fan). Other revelations included a failed summer attempt to prise former coach Kevin Russell away from Stoke and back to Posh, a belief that Dwight Gayle is better than Britt Assombalonga, an admission that, for once, Posh didn’t have a sell-on clause for new million-pound striker Souleymane Coulibaly and that the current Posh squad might be better suited to Championship football than football in League One. Pleasingly MacAnthony spoke about a ‘Grant McCann ‘ dynasty at Posh, similar to the one Eddie Howe has created at Bournemouth, which would require an improvement in the club’s Academy. Surely this implies the chairman will not start looking for new club owners if promotion doesn’t arrive this season, as he suggested on Twitter last season? Posh are to discuss a new contract with midfielder Jermaine Anderson. He’s also come up with some ideas of his own which included a 2k ‘Platinum Perfect Posh Package’ which would cover every ticket home and away and various other goodies and benefits. Posh are expected to introduce category match pricing next season, while looking again at the so-called ‘idiot’s tax’ imposed on those who decide to stroll up to the ABAX on matchday. MacAnthony wants a hall of fame for fans, a fans’ zone which will include Chris Turner’s statue and the lifewall, and the re-branding of the scruffy ‘Venue’ based at the club. He also wants to create a restaurant at the club’s training base at the Nene Park Academy called the ‘Posh Hideout’, improve the inter-action between fans and players, start selling retro kits and promised the Chelsea ticket-selling fiasco wouldn’t happen again.